I can feel the energy this morning. There is much to do today: Superbowl menus to finish up–chili, buffalo wings, pizza, chips and dip, and the liquid refreshments of your choice. So much to do, i feel rushed myself. But, we’re all here; the game isn’t until 3:30. Perhaps we might pause a bit before the cheering begins in earnest find a few minutes to lend a sympathetic ear to the poor apostle Paul as he struggles to guide a fledgling church through a rough patch. The apostle Paul is doing his best in difficult circumstances. He’s writing from Ephesus, fall of 53, early 54 CE, about 3 years after church’s founding. Perhaps he’s already written one letter to folks in Corinth. He’s received a letter from the church in Corinth. He’s had conversations with bearers of the letter and gotten reports from Chloe’s people. Paul knows the church well, a church he founded, along with Silas and Timothy. It was in Corinth he met up with Priscilla and Aquila, who had made their way their from Rome. 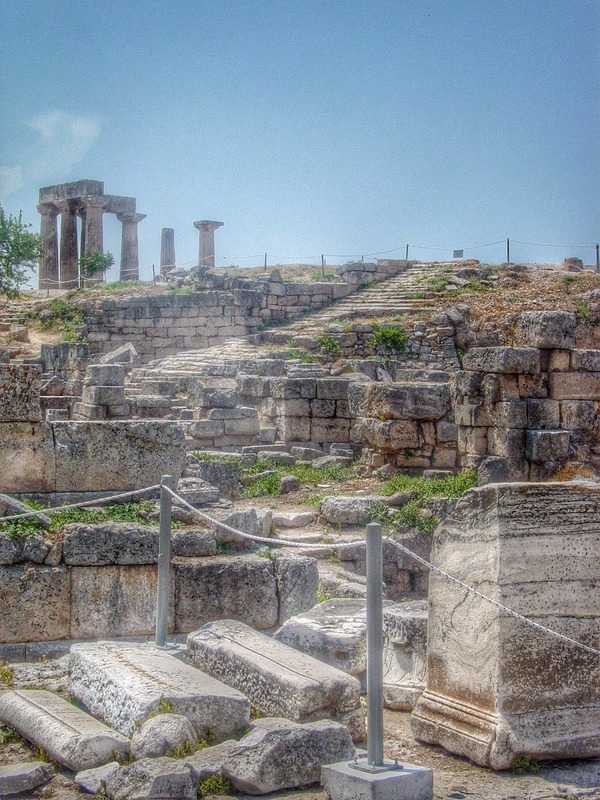 Paul spent 1 1/2 years in Corinth before moving on to Ephesus. The church is mostly Gentile Christians. And there’s been disagreement after Paul left. Issues have arisen; questions on daily living get asked. And as happens, folks come to their own answers and then turn around and try to impose them on others. Apparently Paul’s first letter wasn’t enough straighten things out. A letter comes back with questions, more arguments. From Paul’s letter back, we can surmise that the letter was adversarial, challenging Paul’s views. In chapter seven of 1 Corinthians Paul begins to address their letter to him. Wow–do they know how to ask tough questions! My spouse isn’t a Christian. Should I stay in my marriage? What about widows? May they remarry? You’re single. Jesus wasn’t married. So, tell us, is it more spiritual to be single or married? What about women? Should they be leading in worship? We have friends from the old days. Can we still keep those friendships, even if they’re not believers? Can we as Christians in good conscience eat food sacrificed to idols? OK, probably not high up on your list of disputed theological issues, but an important question for those living in a culture saturated with pagan religious observances. Meat was offered in temples and then put up for sale in marketplace,sold in corner restaurants. And don’t forget the public civic religious celebrations, festivals with free food for all. Before they’d become Christian, these were a normal part of life. For some perhaps, a meaningful religious experience. For others, a free meal–think church potluck or block party hot dogs and hamburgers. Now, that they were Christians, was that meat tainted? Most likely many Corinthians couldn’t afford meat regularly. They were vegetarian by economic necessity, not choice. But at a big city festival, honoring one of the gods or goddesses, when the meat was free to all–could they no longer enjoy a little taste? so we know the whole process doesn’t affect the meat at all. So where’s the problem? Not so much a question after all. Next. Except Paul, being the good apostle that he was, recognizes there’s more to this issue than meets the eye. He sees beneath the surface, a greater tension, showing up in their language. You see, there’s been this underlying issue in Corinth of folks elevating their own importance or their own spirituality above others. Here it shows up again. Some were claiming their superior knowledge–they’d been educated properly. They were in the know and were thus free to buy and eat this meat. They were claiming special knowledge and using it to separate themselves from others in their community, those who weren’t so sure, who in caution, stayed away from such foods. Paul saw the problem clearly–these “educated” ones were belittling those who refused to buy the meat, ridiculing them for their lack of knowledge. You and I know this is an unhealthy situation for a congregation, indeed for any group, but especially for a church. Those claiming to be especially spiritual were threatening the cohesiveness of the church. Their focus on their own spiritual strength, and by extension the perceived deficiencies of others in their community, is a threat to true community. In comparison love builds up. Uh-oh, where’s Paul going with this? “Anyone who claims to know something does not yet have the necessary knowledge.” If anyone imagines they know something, their knowledge falls short. Now Paul zooms into his primary point: anyone who loves God is known by him. All of the theological knowledge they might have is just hot air, if it is not grounded in the love of God. And it’s that love of God that’s the key: loving God, loving neighbor, loving self. It wasn’t that the knowledge the group had about food sacrificed to idols was faulty. After all, Paul agrees with them. They’ve got their theological logic right. It’s the relational piece they’ve forgotten. In their zeal to be right, in their reliance on right thinking, in their pride in their own theological acumen, they had forgotten they had been baptized into Christ. They are all part of one body. Paul goes on to argue that their freedom (actually authority) should not be a stumbling block to their brothers and sisters in Christ. And he enthusiastically proclaims,that if food would cause others to lose faith, he will never eat meat so that not one might fall away. This passage has been used throughout church history, whenever conflicts arise. Usually by the group that doesn’t want the conflict to get out of hand. They argue that when faced with a difficult challenge, we shouldn’t take a stance, we wouldn’t want to offend anyone. Don’t make tough choices. It might make someone mad, folks might leave the church. Remember Paul’s writing for a particular congregation, a particular time, a particular situation. Paul in other places and writings has no problem taking a theological stance, not shy from pointing out of deficiencies in others’ positions. This isn’t about not offending someone’s sensibilities. Paul wants the folks in Corinth to stop dividing themselves by knowledge and instead work on building up one another in love. If this were a teaching about not giving offense to another, the church would never have taken a position against slavery. Never taken a stand for civil rights. never would have had me stand before you preaching today. If the church chooses to remain stuck in the status quo, paralyzed into inaction because of its unwillingness to potentially offend someone, then the church will never move forward to full inclusion of our gay and lesbian brothers and sisters. 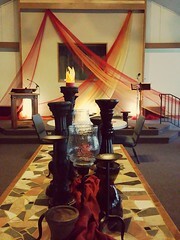 We will never be a church that is living out its calling to embody the radical hospitality of God. Paul’s caution to the church in Corinth is not to never take a theological stance, but to enter into those difficult conversations with an ethic of love not dominance. Paul agrees with their views; their theological reasoning is sound, but their hearts are far from God’s. The president of my seminary, Al Mohler, a vocal proponent of a conservative, even fundamentalist Christian worldview, commenting on Borg’s death in a recent podcast, questioned Borg’s status as a Christian, even going so far to say that those hold similar views are no longer orthodox Christians, in fact, arguing that biblical Christianity and progressive Christianity are “two very different religions.” (3) It’s clear Dr. Mohler believes he has knowledge. But with Paul’s words to Corinth in mind, I must ask, where’s the love? Where’s the love of God that leads to love of neighbor? Compare that comment with Borg’s approach to dialogue with those with whom he disagreed theologically. One of his best books, The Meaning of Jesus: Two Visions, was written in conversation with NT Wright, a more traditional, conservative British New Testament scholar. Throughout the book they find points of agreement and areas of disagreement, but it’s clear they share a bond of friendship that is deeper than theological disagreements. One can possess knowledge, pronounce theological truth claims, and even hold the correct theological position, but if there is not love at the core of our relationships, it’s just passing gas. Paul knows full well that knowledge doesn’t change people; relationships change people. Paul sets the tone for what will be his most eloquent statement on the power of love in chapter 13. We are called not to knowledge, but to love. And when in pursuit of knowledge, we lose sight of love, we lose our way. 1 Odell-Scott, David W., “Paul’s Skeptical Critique of a Primitive Christian Metaphysical Theology”, Encounter, 56.2, Spring 1995. Wow! It was a tough lectionary week and you totally killed it! I love this! Thank you for sharing your thoughts. Thanks! It was a challenging set of texts, wasn’t it? I think context always makes Paul more accessible–and it satisfies the bible nerd in me!